Magnificent Vintage Water Lily Postcard! Today I’m sharing this Magnificent Vintage Water Lily Postcard! A pastel aqua green and gold border surrounds a pond with stunningly beautiful Water Lilies and reeds in this Printable Postcard. The soft colors are accentuated by a glowing yellow and pink sunny sky with a face in the clouds. 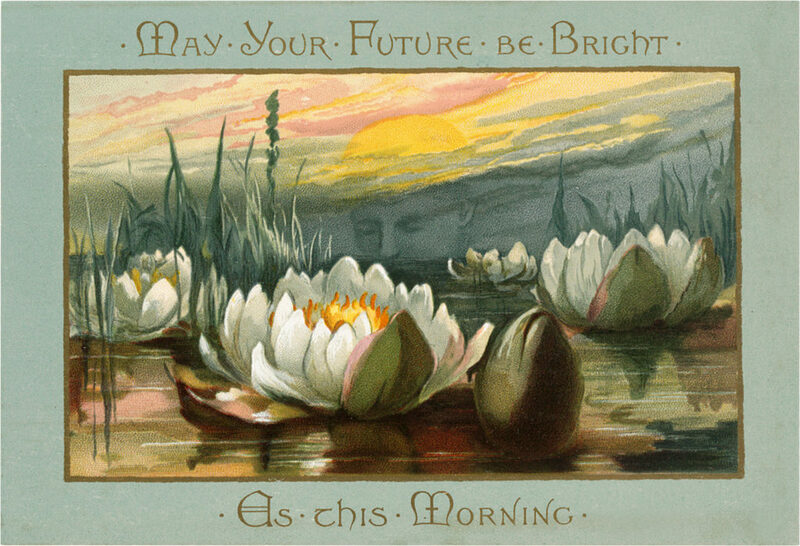 It reads, “May Your Future Be Bright as this Morning,” is gold font. It goes beautifully with this Delightful Black Eyed Susan Postcard. So nice to frame or to use in your Craft or Collage Projects! Love this image, printing for our grand daughter who just graduated from high school last month. She had 4.0 or better all thru high school and graduated with honors, she deserves special attention. Too often we hear about the troubled kids, not the great, well behaved, hard working kids. We are so proud of the person she is we could burst, sure will miss her when she heads to Santa Cruz, CA for college on scholarships. That is fantastic JaneEllen!! You must be so proud 🙂 Congrats to your Grand Daughter!! This is beautiful! So tranquil! Thank you so very much, Karen! I love the water lily postcard. I was just about to send a friend whgo had a knee replacement a card; and this will be perfect to include. Thank you! That sounds like a lovely gesture Missy , I am so glad you can use this postcard!